The EUR/USD is trading a bit off of intraday highs after nearly hitting October highs, and the currency pair is presently trying to hold strong above its psychological 1.50 level. Meanwhile, our important 3rd tier downtrend line continues to play a key technical role since it runs through these important October highs. Therefore, although the EUR/USD may be on the cusp of a near-term breakout, the two key downside technicals (3rd tier and Oct. highs) are still in play. 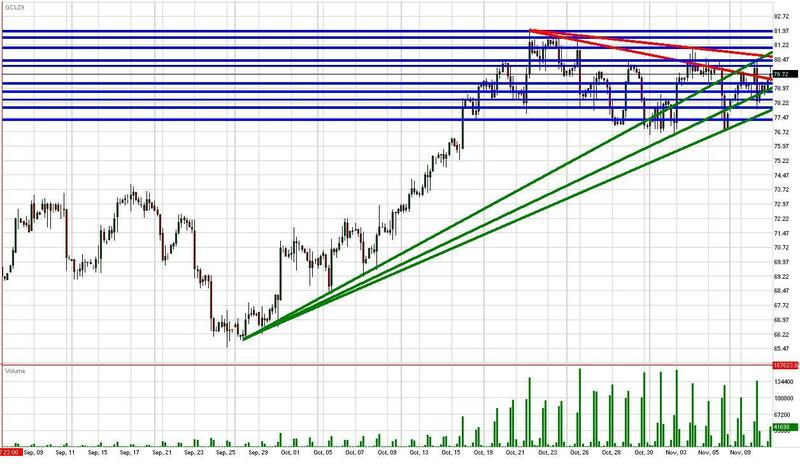 That being said, the EUR/USD has several uptrend lines serving as technical supports along with 11/10 and 11/09 lows. Hence, there is a strong near-term support system in place should the EUR/USD opt to delay its retest of October highs. On a positive note, gold is continuing its upward movements while creating separation from the psychological $1100/oz level in the process. Gold’s incessant breakout could be a signal that the EUR/USD is due for a similar movement since the two investment vehicles are normally positive correlated. U.S. equities are another bright spot as the S&P futures knock on their own 1100 ceiling. A topside breakout in the S&P futures could be another buy signal for the EUR/USD since equities are negatively correlated with the Dollar as well. Although the EU didn’t release any econ data today, the Euro is benefitting from a combination of positive China econ data and dovish monetary statements from several Federal Reserve members. China’s Industrial Production, Retail Sales, and Trade Balance releases all printed hotter than expected, a positive catalyst for equities since China has been the growth engine for the global economic recovery. China’s optimistic consumption and production data is encouraging investors to wade back into riskier investment classes, such as the EUR/USD. Meanwhile, statements from multiple Fed officials reaffirmed that central bank’s monetary policy will likely remain loose for the foreseeable futures due to America’s sluggish economic recovery. Investors are selling the Dollar in reaction and picking up currencies with more conservative monetary policies instead. The EU will release some industrial production data tomorrow, and analysts are expecting a decline of 3 basis points to 0.6% growth. However, investors will likely pay more attention to Friday’s Prelim GDP from Germany. If both data points should print better than expected while U.S. equities move above 1100, this could help boost the EUR/USD beyond 1.50 and October highs. The Cable has returned earlier gains stemming from positive data from China along with a much better than expected Claimant Count Change number. The GBP/USD’s u-turn comes in reaction to BoE Governor King implying that future liquidity measures are not out of the question, thereby leaving the window open for more injections into the central bank’s ballooning QE package. King is playing psychological games with the markets as we’ve seen throughout the year. Governor King is likely trying to deflate the Pound in concern that Sterling may be appreciating against the Dollar too quickly right now. On a positive note for Dollar bears, King’s statement could imply that he is expecting more positive data from Britain and/or another wave of broad-based Dollar weakness, and is bracing the Cable for approaching upward forces. Meanwhile, gold is continuing its charge above $1100/oz and the S&P futures are trading right at their own psychological 1100 level. Gold has led the Dollar in the past, supporting speculation that the Greenback could be in for another round of weakness due to their negative correlation. Furthermore, any substantial topside breakout in the S&P above 1100 could result in a broad-based return to risk, thereby hitting the Dollar and buoying the Pound. However, if this were to happen, it’s uncertain how much and for how long Governor King’s statements would hold the GBP/USD at bay. Technically speaking, the Cable still has our 1st and 2nd tier serving as technical cushions along with 11/06 and 11/05 lows. Furthermore, the psychological 1.65 could now work in favor of the GBP/USD. However, any immediate term weakness in equities and broad-based strength in the Dollar could result in heightened downside movements since the Cable is already being held down by King’s policy comments. As for the topside, The GBP/USD is facing multiple downtrend lines along with intraday and 11/09 highs. Therefore, today’s pullback has created a couple formidable, immediate-term topside barriers. The USD/JPY has recovered from intraday lows, bouncing off of our 1st tier uptrend line. The currency pair is now continuing its consolidative pattern just below its highly psychological 90 level. The USD/JPY weakened during the Asia trading session after Core Machinery Orders printed much higher than analyst expectations (10.5% vs. 3.4% expected). The impressive CMO number is the highest reading since July 2008, indicating export demand and manufacturing production may be taking a turn for the better. China’s wave of economic data may help explain the improvement in Japan’s CMO, since China’s retail sales printed better than expected at 16.2% and Industrial Production at 16.1%. The outperformance of China’s economy is likely benefitting Japanese manufacturers since they are top trading partners. The intraday recovery of the USD/JPY is a bit counterintuitive, and may be a result of buyers jumping in at key technical supports. Technically speaking, the psychological 90 area continues to be a tough psychological area to leave behind. Meanwhile, our 1st and 2nd tier uptrend lines are still serving as technical cushions along with October lows. Therefore, the USD/JPY still has some solid technical cushions in place. As for the topside, the USD/JPY faces resistances in the form of multiple downtrend lines along with the psychological 90 level and 10/12 highs. Japan will be relatively quiet on the data front for the remainder of the week, leaving its upcoming movements in the hands of broad-based Dollar sentiment. However, we will keep a close eye on any reversal in correlation since the USD/JPY has been a bit scattered lately. Gold is continuing its charge above $1100/oz after both China and Japan’s economic data outperformed analyst expectations. In addition to positive data flows from the Far East, investors received a couple statements from Fed officials yesterday that further supported the outlook that the central bank will keep its loose monetary policy intact for the foreseeable future. The combination of these developments has resulted in Dollar weakness and topside movements in gold. Despite yesterday’s retracement to $1100/oz, gold has once again shown a preference for its incredible uptrend. Although another $1100/oz retracement may not be out of the question, gold’s topside separation is certainly encouraging for bulls. Meanwhile, investors should continue to keep an eye on the EUR/USD’s interaction with 1.50 as well as the AUD/USD’s ability to create some topside separation from its October highs. Gold has been more closely correlated with these two major Dollar crosses, meaning any significant movements would likely impact the precious metal. Technically speaking, the only topside barrier we’re able to form right now is intraday highs due to a lack of historical perspective. As for the downside, gold has several uptrend lines serving as technical supports along with 11/10 and 11/06 lows. Furthermore, the psychological $1100/oz level should continue to work in gold’s favor should it be tested again. The S&P futures are trading off of intraday highs after briefly setting new 2009 highs. However, the psychological 1100 level is proving to be a tough technical barrier once again, resulting in present hesitation. Investors are reacting positively to an encouraging wave of econ data from both Japan and China. Japan’s Core Machinery Orders data came in much higher than analyst expectations (10.5% vs 3.4% expected), signaling a pickup in Japanese manufacturing production. As for China, Industrial Production, Retail Sales, and Trade Balance data all outperformed while pricing data disappointed slightly to the downside. The improvement in China’s Trade Balance and Retail Sales data points are very encouraging developments. The boost in China’s trade surplus shows exports are picking up since Retail Sales rose by 16.2%. The rise in export demand implies that global rates of consumption may be improving. As a result, investors are showing a preference for more risk-oriented investment vehicles, sending the S&P futures to 1100 in succession. In addition to positive econ data from the Far East, multiple statements from Fed officials supported the present assumption that the central bank will keep its monetary policy loose for the foreseeable future. The concept of a continuation of cheap corporate funding could improve corporate performance, thereby applying an upward momentum to U.S. equities. Meanwhile, Australia’s Unemployment data late Wednesday EST could move the FX markets a bit, thereby impacting the S&P futures due to correlative forces. Should Australia’s job data print better than expected, investors may anticipate further rate cuts in the near-term, thereby weakening the Dollar and providing a positive catalyst to Thursday’s equity trading session. The U.S. will release weekly Unemployment Claims data tomorrow, and any reading below 500K could have a psychological impact on equities. Technically speaking, the psychological 1100 level is our final topside barrier for the near-term besides our 3rd tier uptrend line. As for the downside, we’ve created a new 2nd tier uptrend line to complement our 1st tier uptrend line. Additionally, the S&P futures find technical cushions in the form of 11/10 and 11/09 lows along with the psychological 1075 level. Meanwhile, investors should keep a close eye on the EUR/USD’s interaction with 1.50 and its October highs. Any sizable breakout above these two technical barriers could imply a similar movement in the S&P futures due to their positive correlation. Crude futures are consolidating around the psychological $80/bbl level after hitting interference at our 3rd tier uptrend line. Meanwhile, the Dollar is weakening and equities strengthening due to a combination of strong China econ data along with dovish statements from Fed officials. The impressive Industrial Production and Retail Sales data out of China helps compensate for recent news that China’s gasoline prices will rise by around 3-5%. The increase in production and retail consumption in China bodes well for crude’s aggregate demand. However, crude futures are still facing headwinds at $80/bbl and previous 2009 highs as investors are likely waiting to see how the EUR/USD and S&P deal with 1.50 and 1100, respectfully. A topside breakout in either could signal a similar movement in crude due to their positive correlations. On a positive note, gold has extended its gains above its psychological $1100/oz level. Gold has led the way recently and the precious metal’s topside statement could prove to be a positive signal for crude. Technically speaking, crude faces technical barriers in the form of our new 2nd tier downtrend line along with 11/05 and 2009 highs. Furthermore, $80/bbl continues to serve as an important psychological level. As for the downside, crude multiple uptrend lines service as technical cushions along with 11/10 and 11/06 lows. Additionally, the psychological $75/bbl level could prove to be a psychological support should conditions deteriorate. Meanwhile, investors will receive weekly Unemployment Claims data tomorrow along with Crude Inventories. If both data points come in lighter than expected, this may provide crude futures with a bit of a boost to the topside, and vice versa. Technically speaking, crude has our 1st tier uptrend line serving as a technical cushion once again along with 11/06 lows and the psychological $75/bbl level. As for the topside, crude faces previous 2009 highs. Meanwhile, crude’s movement should follow the path of the Dollar for the most part until the wave of Chinese econ data late Tuesday EST.